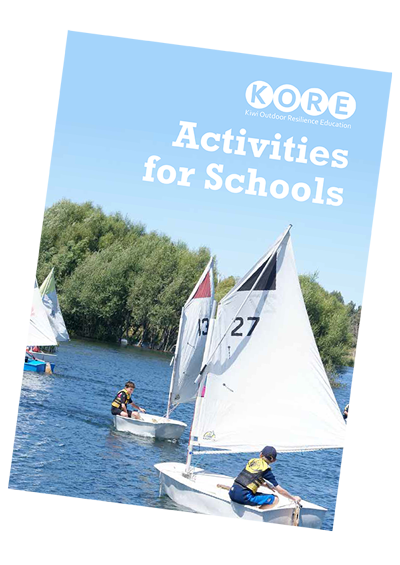 KORE is carrying on a decades long tradition of introducing school groups to sailing. Each year we get over 3,000 students trying sailing - most for the first time. The sailing programme has been added to with Water Activities and River Crossing options now available, both of which build on our commitment to water safety. Far more than a fun day out of school, KORE activities are grounded in the curriculum, and in particular all five Key Competencies from the New Zealand Curriculum; Thinking, Using language, Managing self, Relating to others and Participating and contributing. Also, the activities are planned to increase awareness of the importance of safe practice around water; we have worked closely with Water Safety New Zealand in developing the best possible programmes. The combination of fresh air, learning through play, physical activity, responsibility and being a member of a small team, brings a sense of pride in achievement. In addition, children who do not do well in the classroom are given a chance to shine and frequently do. KORE has extensive experience running outdoor classes with children in an environment that involves variable conditions and multiple hazards. We have therefore developed high levels of expertise to manage class groups in these situations. Building students' confidence and developing within them a respect for their natural surroundings increases their resilience. Outdoor skills are the perfect building blocks for this. KORE will develop skills associated with being confident in a wilderness environment; skills and confidence that can be called on when facing other new or difficult situations. In short, resilience.